Is The Amazing Spider-Man the Next Batman Begins or Merely the Next Superman Returns ? 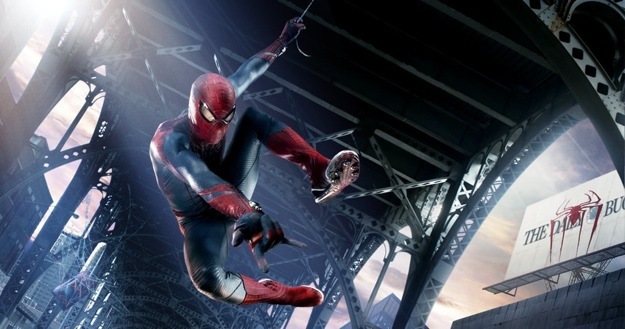 There are a number of ways to judge the six-day $140 million debut of The Amazing Spider-Man (review). First of all, in all but the most unlikely of circumstances, a film grossing $140 million in its first six days ($65 million over the traditional Fri-Sun weekend) is a pretty big financial success. For the record, the film played 44 percent 3D and 10 percent IMAX. The film earned an A- from Cinemascore and played 75 percent over 12 years old and 25 percent families with kids under 12. Of the over-12 audience, it played 54% were male and/or over 25 years old. Of the under-12s, 73 percent were under 10 years old and 65% were boys. While final figures won't drop until Monday, the six-day weekend puts in between 25 and 30 among the biggest six-day totals. It's the fourth-biggest Fri-Sun debut of 2012 and the second-biggest of summer. On the other hand, as far as Spider-Man films go, it's actually pretty weak sauce. Spider-Man 2opened on this same holiday weekend back in 2004, earning a then-record $180 million in its first six days (with $88 million over the traditional Fri-Sun weekend, among the top-five opening weekends ever at that time). The first Spider-Man film (audio commentary) opened in May 2002 to a then-record $114 million Fri-Sun debut, earning $144 million over its first six days of play, three of those days falling in the middle of the school year no less. As for Spider-Man 3, it also broke the Fri-Sun record back in May 2007 ($151 million) before earning $176 million in its first six days. So factoring in inflation (Spider-Man -- $196 million; Spider-Man 2 -- $229 million; third best six-day of all time, Spider-Man 3 -- $202 million) and the 3D ticket-price bump, The Amazing Spider-Man sold far fewer tickets than its predecessors over its first six days of release. Point being, the Sam Raimi trilogy set box office records, while The Amazing Spider-Man merely exists as another relatively large-scale blockbuster amid a sea of preordained blockbusters. But you say, the reboot was rebuilding the brand from the ground up and it had to deal with the general dissatisfaction from Spider-Man 3. You might even say that this film was playing the same kind of long-ball that Warner Bros. played with Chris Nolan's Batman Begins seven years ago. That would be true, which accounts for the alleged $220 million budget for The Amazing Spider-Man, an allegedly cheaper reboot that nonetheless cost as much as Spider-Man 2, $100 million more than Spider-Man in 2002, and only about $50 million less than Spider-Man 3. Batman Begins cost $150 million back in 2005, or far more than Batman ($45 million), Batman Returns ($80 million), Batman Forever ($100 million), and possibly Batman and Robin (officially $110 million, but allegedly as high as $200 million). But Batman Begins did three things that The Amazing Spider-Man did not. The Amazing Spider-Man did not so explicitly differentiate itself from the prior Raimi series so as to bring about a desire to see a whole new batch of Spider-Man stories told in this specific universe (Star Trek and Casino Royale pulled this off as well, to a lesser degree). Second, it did not fully whet the appetite for an inevitable sequel while in turn telling a closed-ended story that stood on its own (the film is full of dropped plots and loose ends that were either cut during post-production or intentionally left open for the next chapter). In short, it was nowhere near as good as Batman Begins and Casino Royale nor as crowd-pleasing as Star Trek. I'd argue that Sony is in no better position now then if they had just let Sam Raimi make his Spider-Man 4 (or conversely, let Marc Webb make whatever Spider-Man movie he wanted instead of forcing an origin and/or cutting the film to ribbons in post-production). Third, and even if you disagree with the above two points (I'm aware there are moviegoers who preferred The Amazing Spider-Man over Spider-Man and/or Spider-Man 2), this one is objective: It failed to come even close to the opening weekend/week totals of its predecessors. Batman Begins may not have exploded over opening weekend in the vein of Spider-Man or The Matrix Reloaded, but it earned $72 million over its first five days (it opened on a Wednesday). That was actually a record for the Batman series at that point, ahead of Batman ($57 million), Batman Returns ($60 million), Batman Forever ($66 million), and Batman and Robin ($52 million). Even Batman Begins's unadjusted Fri-Sun total ($48 million) was ahead of Batman ($42 million), Batman Returns ($46 million), and Batman and Robin ($43 million), coming just below Batman Forever ($52 million). Star Trek plowed past the prior Star Trek films over its debut weekend, out-grossing all but the top two entries (Star Trek: First Contact at $90 million and Star Trek IV: The Voyage Home at $109 million) in just the first 3.5 days ($79 million). The Amazing Spider-Man didn't cost any less than the average Spider-Man film while grossing significantly less over its debut weekend even with 3D-inflated ticket prices. If it were a traditional sequel, it would be a most troubling debut. Since it's being treated as a 'part one,' slack should perhaps be cut, especially considering how much the overseas market has grown even in the last few years, partially thanks to the foreign popularity of 3D. This could be a case like the far inferior Pirates of the Caribbean: On Stranger Tides, which grossed below the series norm ($240 million) in America only to do huge 3D-inflated business overseas and cross $1 billion worldwide. At the end of this weekend, after about a week-and-a-half of international play, the film has earned $341 million worldwide, which points to a $675-$750 million worldwide total offhand. So yeah, come what may, it's a hit. So what does this performance mean in the long run, for this film, for the would-be Spider-Man series, and for franchise reboots as a whole? Since 2001, the big July 4th openers (Scary Movie 2, Men In Black 2, Terminator 3, Spider-Man 2, War of the Worlds, Superman Returns, Transformers, Hancock and Transformers 3 have generally made between 1.9x and 2.1x their six-day totals (Cats and Dogs, The Devil Wears Prada and Ice Age 3 did better while The Twilight Saga: Eclipse and The Last Airbendercouldn't even reach 1.8x). So presuming The Amazing Spider-Man doesn't end up having significantly better or worse legs, that puts its domestic total between $265 million and $295 million. The film should hold up pretty well over the next weekend, since there is only one new wide release, Ice Age: Continental Drift. But The Amazing Spider-Man officially becomes past-tense come July 20, when The Dark Knight Rises debuts. If the third Nolan Batman film is anywhere near as good as the buzz is suggesting (it screened to a handful of lucky bastards on Friday, and I won't see it until a few days prior to opening), I can't imagine anyone giving two bits about Marc Webb's loose remake of Sam Raimi's Spider-Man. So whatever money it's going to make must be made in the next two weeks (also, with a $35 million on opening day, it's on the lower end -- 4.0x -- of July 4th long weekend multipliers). Now if it does $275 million domestic and $400-$500 million overseas, it's still a pretty big hit. But the question is whether or not Sony successfully restarted their crown jewel comic book franchise. Come May 2014, will fans and general audiences line up for The Spectacular Spider-Man (or whatever it's called) with the same relative fervor that they lined up for even The Bourne Supremacy (a $52 million opening coming off the $29 million debut of The Bourne Identity) or Iron Man 2 ($128 million debut off of the original's $100 million opening weekend)? One cannot presume a Batman Begins-to -Dark Knight level upsurge in respective opening weekends, although Paramount is probably expecting one for Star Trek 2 next summer. Other than fans who desperately want to see (SPOILER... ) Emma Stone fall off a bridge and get her neck snapped (or the pie-in-the-sky fantasy of a Sinister Six team-up film), are there a huge number of Spidey fans who are exceptionally gung-ho about seeing this universe's version of The Green Goblin or Dr. Octopus or even Venom? And the other untapped villains aren't exactly the stuff of general audience fandom (Rhino! Electro! Mysterio! ), unless they team up in part three. The inevitable sequel won't explode out of the gate a la Pirates of the Caribbean: Dead Man's Chest or The Dark Knight (unless they cast Johnny Depp as Dr. Octopus) and that's a problem unless Sony can keep costs down. I'd argue that Sony may have won the battle with The Amazing Spider-Man (it's not a flop by any means), but they may have lost the war.